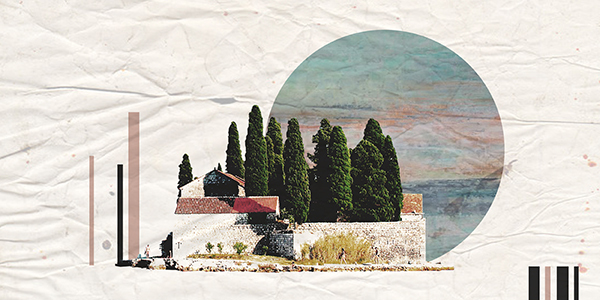 What does Pontikonissi & the Island of Saint George in Montenegro have in common? 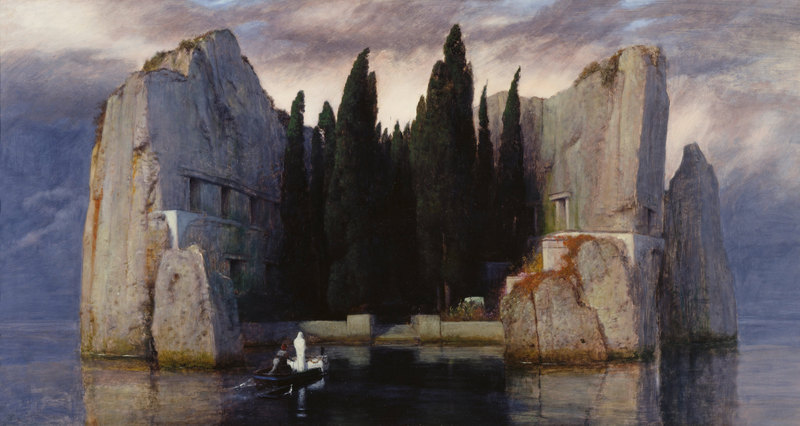 The painting I am referring to is titled “The Isle of the Dead” and is part of a series of 5 works of art, created between the years 1880 and 1886 by the seminal painter Arnold Böcklin. The title was inspired by the art dealer, Fritz Gurlitt. Although today’s Pontikonissi doesn’t bear many similarities to the painting, the melancholic landscape of a photo taken 41 years after the creation of the artwork summoned up the imagery of “the Isle of the Dead”! 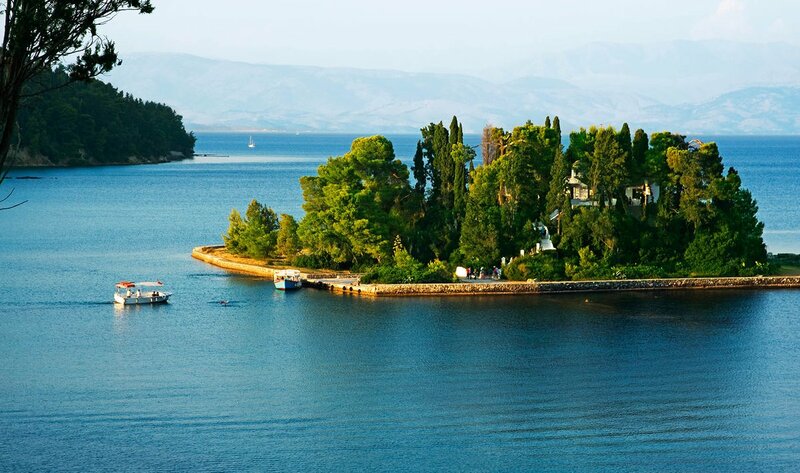 Five hundred kilometers to the north of Corfu, in Montenegro, the little island of Saint George is still quite similar to Böcklin’s work. The painting depicts a bleak, rocky island, shrouded by a dim veil of sky and sea, which is approached by a small boat. The oarsman on the stern maneuvers to the shore while a white figure stands next to a white lump, presumably a coffin, adorned with flowers. The island appears brimful with high cypress trees and rocks that enhance , overall, ghastly atmosphere of the landscape and the feeling of mourning it evokes. In January 1907 Rachmaninov was in Paris and happened to see a black and white reproduction of the original painting. 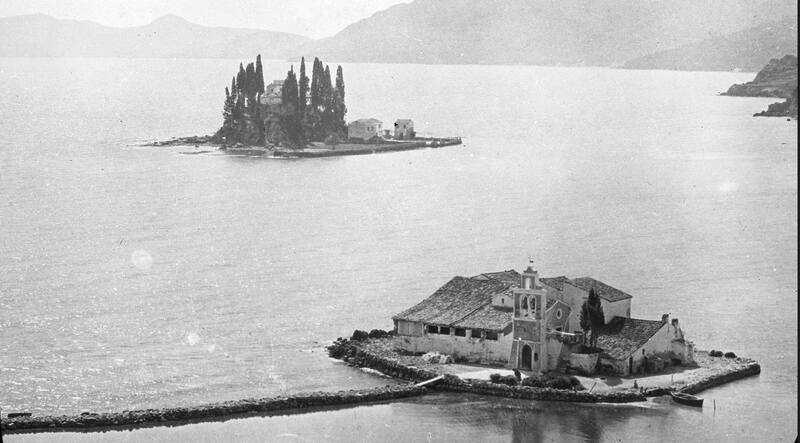 The sullen image of the bare island and the boat transferring a coffin haunted the composer and became the source of inspiration for his sametitled musical piece (symphony Op. 29). He started his composition almost immediately after this encounter and completed it within a few months. When, years later, he traveled to Leipzig to see the original painting, he said that “If I had seen first the original, I, probably, would have not written my Isle of the Dead”. He could see no more the correspondence between his first impression and the original artwork. Rachmaninov attempted to link the painting το his musical piece, letting the auditor visualize the following imagery: We are in the Underworld, a ghastly place, feeling the burning the lightning and thunder striking us, bursting our eardrums. We cannot bear it anymore. We, desperately, seek to escape. Thus, we depart, sighing with relief, the music has calmed down and the boat is rowing away from the isle of the dead.